On a recent coffee run I saw a sign at a local restaurant located near a major freeway. 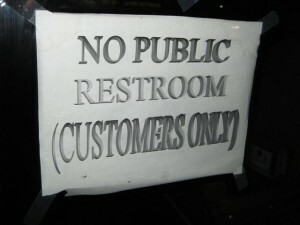 “No Public Restroom (Customers Only),” it read. The sign was posted on the front door where everyone would see it – in fact, that and the hours were the only things posted there. It reminded me of a church I interviewed with years ago. The church was having trouble reaching out to younger people, but when teens started hanging around outside the church so they had posted “no skateboarding” signs all over. “They chip the steps,” I was told. “Couldn’t you put a concrete repair line item in the budget and welcome them in?” I asked. Needless to say, I was not invited to pastor that church. Isn’t there a way that the restaurant with the “no public restroom” sign could use the traffic to their advantage? We’ve found that when we don’t charge for things like coffee, snacks, paperback Bibles, devotional books and sermon CDs, people feel welcomed and loved. And they come back! Our family grows and our financial needs are met. Who made better use of their chance to interact with the public? What model is a better one for Christ’s church to emulate? What opportunities might we be missing right now??? Great lesson, Pastor Steve, and I agree that, too often, we look first to our convenience (who wants to clean the restrooms; who wants to tidy the concrete?) and then to our mission. I heard a story about a church located close to a mental facility who had a steady stream of visitors who were not usually welcomed in churches. One stayed. There is more to the story; I just wanted to affirm your thoughts. Blessings on your ministry. Wow! Never thought of how to turn that “customer only” thought around. That gives me a good answer to when my parishioners ask the same questions. Thanks for the post!